WASHINGTON — In a single-file line, they trickled into the Oprah Winfrey Theater on the ground level of the Smithsonian National Museum of African American History and Culture (NMAAHC) and took their seats. 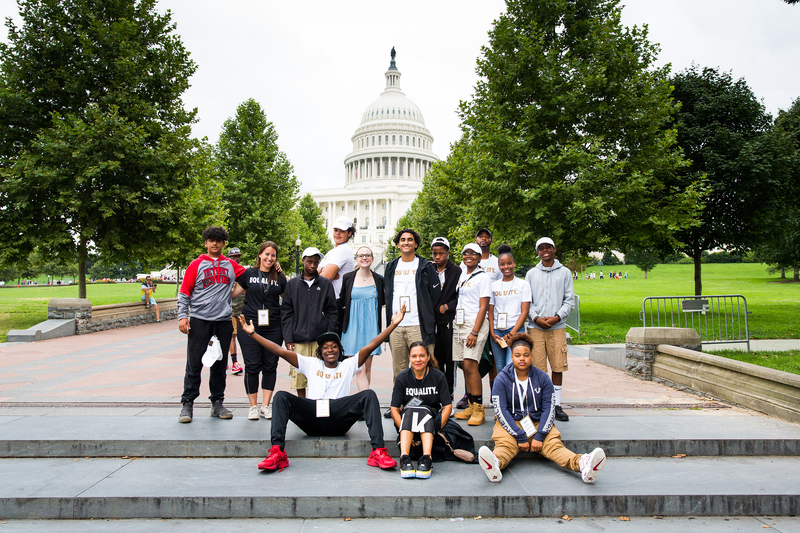 A group of 59 students from across the country, who had journeyed to the nation’s capital in the heart of the summer at the invitation of Nike, and the brand’s most impactful athlete. The young men and women, ages 12-17, were handpicked by Nike’s community partners from Atlanta, Baltimore, Chicago, Detroit, Los Angeles and New York for a unique two-day experience that included a tour of the monuments, a visit to Capitol Hill to meet with representatives from their respective congressional districts and a special surprise that they awaited after squeezing into five rows in the museum’s auditorium. LeBron James had helped bring this trip to life for the kids in the audience donning white shirts with “EQUALITY” sprawled across their chests in gold lettering. But the newly minted superstar of the Los Angeles Lakers, who takes pride in being “more than an athlete,” had an important scheduling conflict that kept him from being at the NMAAHC. Less than 24 hours before the event, James opened his I Promise School, a public institution for 240 third- and fourth-grade at-risk students in his hometown of Akron, Ohio. On his left foot, he wore the shoe in white. And on his right foot, he wore the shoe in black. Each shoe featured the powerful word. 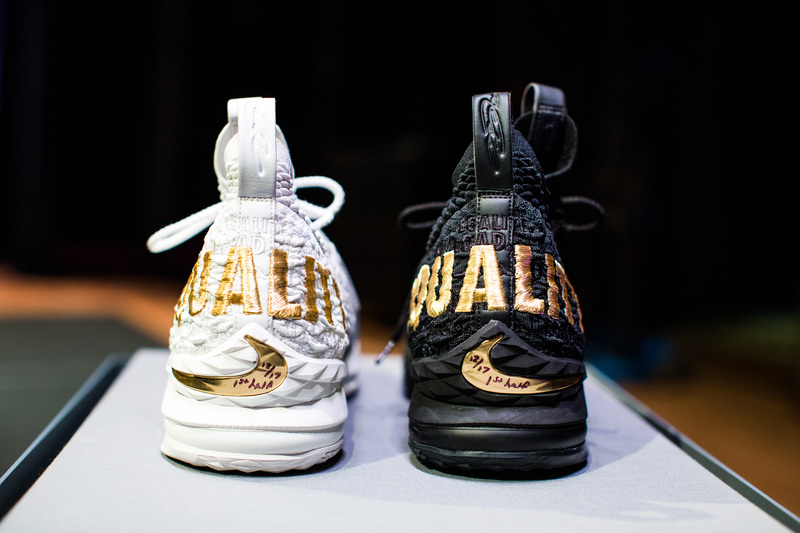 The Nike LeBron 15 “EQUALITY” sneakers are currently on display at the NMAAHC. Both Nike and James are founding donors to the museum. The video included a specific message — James told the story behind his game-worn pair of shoes that sat onstage in a glass case in front of the screen. Back on Dec. 17, 2017, while still a member of the Cleveland Cavaliers, James made a statement with these same kicks during Cleveland’s final scheduled meeting of the 2017-18 NBA regular season against the Washington Wizards in D.C. He wore his signature Nike LeBron 15 “EQUALITY” sneakers — but with a bit of a strategic twist. On his left foot, he wore the shoe in white. And on his right foot, he wore the shoe in black. Each shoe featured the powerful word, which James and Nike seek to embody, embroidered in gold across the heel. “I watched the game when he wore them,” said Dakari, 14, who also hails from Detroit. “And those shoes mean way much more than just hooping.” Months after the game, in February of this year, Nike announced the limited-edition release of 400 pairs (200 black, 200 white) of the LeBron 15 “EQUALITY.” And via an online drawing, available exclusively in the United States, more than $400,000 in donations was raised to directly benefit the NMAAHC. Both Nike and James were founding donors of the museum, with the brand presenting $2 million and the King giving $2.5 million to specifically support the “Muhammad Ali: A Force for Change” exhibit. The kids watched intently as James announced that he’d be gifting the shoes to the NMAAHC. They were the first to see them inside the museum. According to spokeswoman Lindsey Koren, the kicks will go on display this fall in the basketball case of the sports gallery on the building’s third level. Damion Thomas, sports curator at the NMAAHC, officially accepted the shoes on behalf of the Smithsonian. Thomas says the meaningful LeBron 15s, like any other artifact belonging to the museum, had to undergo a screening process and be approved by a committee to be included in an exhibit. Yet deliberation on these shoes, he added, was steadfast. In addition to their private tour of the NMAAHC, the students’ trip also included a tour of the monuments and a visit to Capitol Hill to meet with representatives from their respective congressional districts. At the request of James, all 59 students received an opportunity to take pictures with the encased sneakers to post on social media before the shoes were whisked away by gloved museum staff members to be stored until they make their exhibit debut. Thomas, and other docents, then led the kids on a private tour of select galleries in the facility. Despite living a short drive away in Baltimore, 16-year-old Wesley and his younger sister Monique had never visited the NMAAHC until now. He and other students, who had no idea that James was the benefactor behind their experience before the video started rolling, expressed their appreciation for the man they couldn’t help but affectionately refer to as the King. I feel my calling here goes above basketball. I have a responsibility to lead in more ways than one, and I take that very seriously. On this trip to the museum, LeBron James’ responsibility was fulfilled.